Below are specially priced cartridge-style chloramine filters, all using the exceptional Pentek CRFC20-BB Chloramine Reduction Radial Flow Carbon Cartridge. We’re convinced that this cartridge, though it costs a little more than other chloramine cartridges we have available, offers the best value in residential and small commercial chloramine removal. 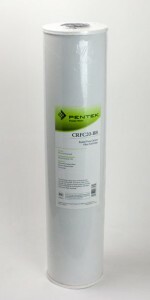 The unique radial flow granular style CRFC2–BB provides long life and minimal pressure drop, as compared with carbon block chloramine cartridges. The package systems we’ve put together include a filter wrench, housings, extra O Rings, brackets, and cartridges. All housings have 1″ ports (3/4″ or 1.5″ available upon request). All housings, both 20″ and 10″, are tough, reliable Pentek “Big Blue.” All housing packages include mounting screws, heavy duty metal brackets, and one extra housing O Ring. These systems are designed for parallel installation of the chloramine filters to assure minimal pressure drop and optimal chloramine performance. See the reference pages listed below for installation pictures. Note that all chloramine filters are 20″ and all sediment filters are 10″. 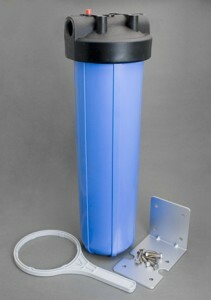 High Performance Cartridge-Style Chloramine Filters. Chloramine Removal (our testing of our own products). 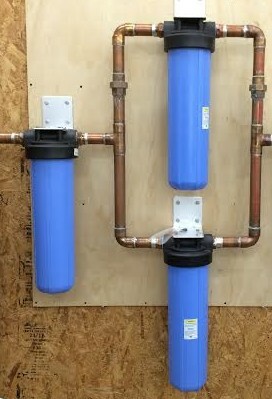 General Installation Instructions for Compact Whole House Filters.